It sort of hurts just to look at it, doesn’t it? I’m entering her on next season’s America’s Got Talent in the contortionist category. 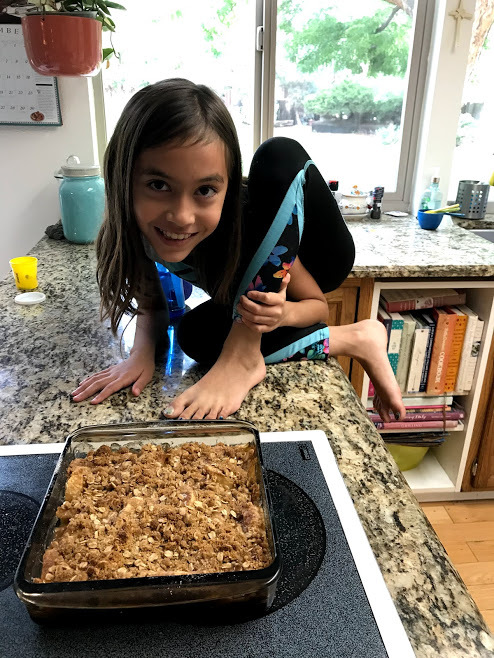 Duh, how else would you pose with an apple crisp. That picture is so Kaiya! She’s really something, isn’t she? She also can put her leg straight up next to her head. the crisp looks yummy! How fun you get to cook with your grand kids (because they live so close and are older). Mine live an hour away.. Last Sunday at lunch the 4 year old announced that she wants me and her grandpa to move closer so she can see us anytime she wants and next door, so she can walk to our house. Loved it! Well get that for-sale sign up, Missy!